During a recent conversation with some colleagues of mine, I figured out that some of them seem not to know what is the actual importance and utility of overriding the hashCode( ) method from the Object class. Therefore, I wanted to dedicate a post for this topic. 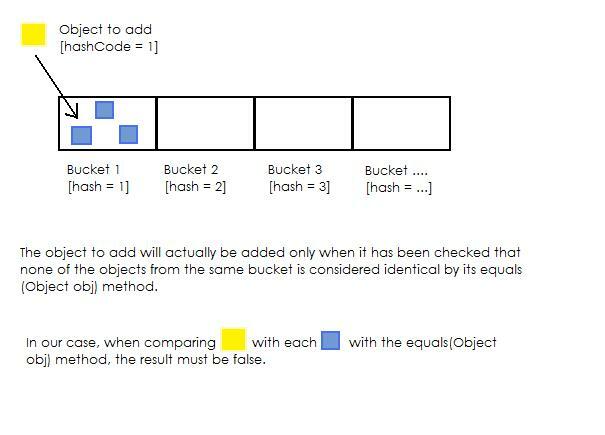 Since we are working with a Set, after having identify the appropriate bucket, the Object's equals(Object obj) method will be executed against each objects that are already stored in the same bucket to make sure a same object is not added twice to the Set. Several Objects that should be considered identical can be redundantly stored in the HashSet given they're not stored in the same bucket. 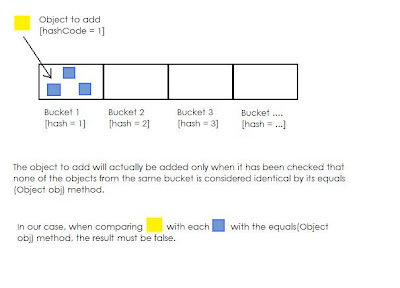 Theoretically, an optimal hashCode( ) method would distribute the objects to store in a Hash collection among all the available buckets, so that the number of execution of the equals(Object obj) method is more or less the same regardless the bucket in which an object insertion/comparison/removal will be done. I had the Eclipse IDE generate the equals(Object obj) and hashCode( ) methods and the execution took around 0.01 second. After making the hashCode( ) method constantly return the value 1, the execution took 2.681 sec. A good practice would be to always implement the equals(Object obj) and hashCode( ) methods when defining a POJO class, no matter it will be stored in a hash collection or not.